The 2016 Jeep Compass is a small crossover SUV that’s designed to provide excellent off-road capability, spacious seating, and high-tech convenience features. On weekdays, the Compass guides you around town with its smooth, quiet ride. Modern comfort features, like heated seats and leather upholstery, take comfort to new heights. When the weekend arrives, the Compass treats you to outdoor adventure and trailblazing capabilities. Modern safety gear delivers substantial passenger protection. If you crave rich interior style, the 2016 Jeep Compass is the crossover for you. 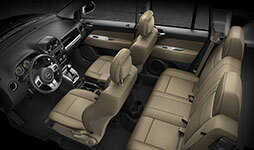 Upscale features, like handsome leather upholstery and heated front seats, provide notable passenger comfort. Both rows of seating offer family-friendly head- and legroom. Innovative features, like the lift-out tailgate speakers, help you make the most of your latest outdoor adventure. The sunroof makes the Compass feel luminous and open. The Compass also delivers ample cargo space, with 22.7 cubic feet behind the rear seats. To haul larger items, simply flip down the second-row seats to create 53.6 cubes. The 2016 Jeep Compass is stocked with all the latest tech features. Use the cabin’s 115-volt, household-style power outlet to do a little work on your laptop. The navigation system delivers convenient turn-by-turn directions so you’ll feel at home in previously unexplored territory. The central infotainment system includes smartphone integration features, giving you the power to make hands-free calls or stream your music collection from devices. The auto-dimming rearview mirror minimizes nighttime glare – and you never have to give it a second thought. Plug devices into the USB port to keep them charged on the go. You can’t beat the Compass’s safety lineup. 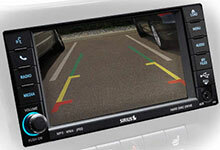 Use the rearview camera to spot any obstacles in your path. Hill start assist keeps the Compass from rolling backward as you travel up steep hills. Antilock brakes offer strong stopping power when you need it most. Stability and traction control increase driver authority when road conditions turn rough. The cabin’s many airbags, including side curtain airbags, help mitigate passenger injury during a collision. 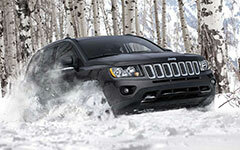 Jeep knows you need plenty of power to take on rugged terrain, and the Compass certainly delivers. Choose from a range of engine options for the performance you crave. This crossover combines a smooth, swift performance with excellent fuel economy, earning up to 30 mpg on the highway. Choose all-wheel drive to make the most of your off-road explorations. 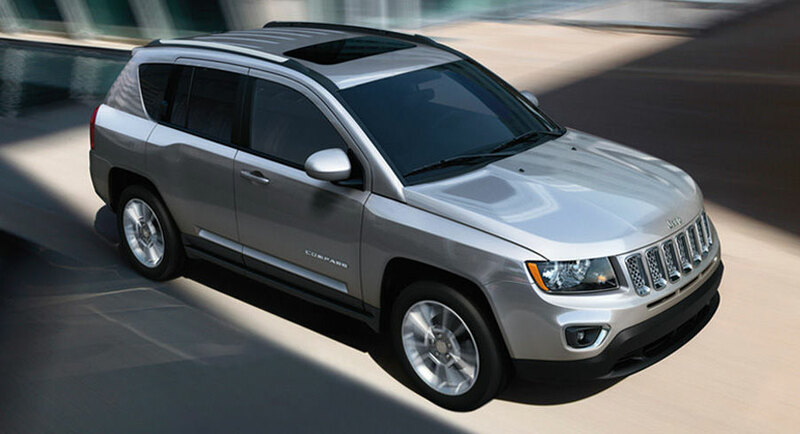 When you want the most in interior luxury and tech features, chose the Jeep Compass Latitude. The cabin’s heated front seats ward off the winter chill. The Latitude’s infotainment system keeps you connected with features like navigation. Use the 115-volt power outlet to do a little work on your laptop or charge your power tools. This model also offers a little exterior glamour; its chrome exterior accents that set it apart from the pack. The Compass cabin is handsome and accommodating. The image’s helpful gridlines boost confidence as you back out of cramped spaces. Battle the elements with the Compass’s rugged off-road performance. Explore new heights with increasing levels of passenger safety. If you’re shopping for a family-friendly crossover that combines interior comfort with strong off-road capabilities, the 2016 Jeep Compass is a best-in-class pick. The Compass cabin delivers spacious, supportive seating and tech features, like smartphone integration, that keep you connected. On the road, the Compass provides a swift, sure performance. 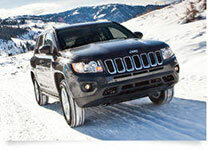 Its four-wheel-drive systems are a segment standout, giving you the power to do some serious trailblazing. Safety features offer impressive passenger protection. Feel the power of the Compass on a test drive today!